The Innova is one of Toyota's best selling products not only in Malaysia but in other markets as well. It is a smart and handsome-looking MPV. It features LED projector headlamps with LED DRLs, a large front grille, stylish 17-inch alloy wheels, large combination tail lights, etc. With the latest update, the Innova is now available in Phantom Brown color. The interior of the Innova is very spacious and comfortable. Features like LED cabin illumination, glove box with cooling function, 8-inch infotainment system, etc. make the Innova one of the most feature-loaded MPV in the market. In the engine department, there is only a single option - a 2.0-litre engine with 139 PS and 183 Nm. The Innova has received 5-star ASEAN NCAP safety rating for adult occupant safety. Toyota has set the starting price of the Innova at RM 82,480 for the 2.0E M/T (TAXI) variant. Have a question on Innova? Innova is available in 6 different colors - Silver Metallic, Medium Silver Metallic, Attitude Black, Super White II, Crimson Spark Red Metallic and Avantgarde Bronze Metallic. Watch latest video reviews of Toyota Innova to know about its interiors, exteriors, performance, mileage and more. If there is one product in Toyota’s lineup which literally complies with the common saying “it came, it saw, and it conquered”, it has to be the highly successful Toyota Innova. The Innova came at a time when MUVs were perceived to be boring and were considered high on functionality and practicality, but too low on desirability. The Innova, with its premium appeal and perfection in almost all the aspects, rewrote all the rules of MUV segment, and the new generation model currently on sale has only taken the benchmark a bit higher. The Toyota Innova, with its revamped exterior, interior, and mechanicals, is currently available in a total of four variants – E (manual), E (automatic), G (automatic) and X (automatic), with the top-spec X trim getting all the bells and whistles that are commonly not seen on MUVs. Prices for the Innova start at RM 101,739 for the base E (manual) variant, going all the way up to RM 125,324 for the top-end X variant, with the MUV being offered in a total of six colors – Medium Silver Metallic, Silver Metallic, Attitude Black, Super White, Avant-Garde Bronze Metallic, and Crimson Spark Red Metallic. On the inside, the new Innova has taken a whole leap forward with its uber-cool layout for the dashboard, which again, is pretty unconventional for current MUV standards. The T-shaped steering wheel with fake aluminium as well as wood inserts has been shared with the Fortuner, and comes with integrated buttons for audio and Bluetooth, and is adjustable in both tilt and telescopic manners. The cascading dashboard with a characteristic flow at the top does get a large 7-inch touchscreen infotainment system at the centre, which is surrounded by fake aluminium panels as well as a thick fake wood panel on both the sides. The center console becomes sort of minimalist towards the bottom portion with small buttons for the climate control. The infotainment system, apart from the regular bits, comes with Wi-Fi support, internet browser, voice commands, and reverse camera, but misses out on Android Auto and Apple Carplay. The overall seating posture is quite upright and SUV-ish, with the Innova getting an option of captain seats to make it feel more upmarket and comfortable. The overall build quality feels built to last, in a typically Toyota fashion. The Innova has always been one handsome looking vehicle for the functional segment to which it belongs. This new generation Innova has only set standards even higher. The MUV looks far from being boring and can give some higher priced SUVs a run for their money, as far as overall styling and stance is concerned. At the front, the Toyota Innova has got a huge inverted-like grille which gets chrome slats to make it look premium when viewed head-on. The upper corners of the grille get flanked by two sleek looking headlamp units, which come along LED projector headlamps withdaytime running LEDs integrated within them. The top-spec X trim, in addition, gets lower body skirting to give it a bit of sporty appeal. From the sides, the Innova looks sharp and aerodynamic proof, thanks to its long stance complemented by a long character line flowing all the way from the headlamp to the rear tail light. The classy looking alloy wheels, along with chrome finish for door handles and window waistline, make the overall side profile look elegant. It is the rear profile of the Innova which reminds you of the fact that it belongs to the MUV category, with the overall styling at the rear appearing slightly boxy. The sabre-tooth shaped tail lamps, though missing out on LED elements, still look nice, and are separated from each other via a thick black strip with the Toyota logo in between. The roof spoiler at the rear adds some jazz to the otherwise simply styled rear. The Toyota Innova has always been known for its road manners and comfort within the cabin, with the MUV creating a new benchmark in the segment. The new Innova is no exception, and while the vehicle still comes with the conventional suspension setup, feels more composed, thanks to the longer wheelbase and large 17-inch alloy wheels shod meatier tyres. Inside the cabin, all the three rows get ample amount of legroom, shoulder room and headroom, with the Innova’s third row being comfortable enough to accommodate two full-size adults with ease. 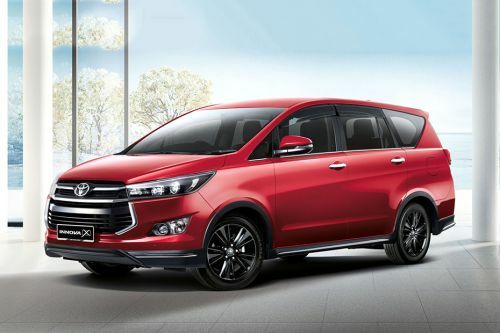 For the Malaysian market, Toyota has made the Innova available in only one engine option– a 2.0-litre VVT-I petrol motor, which is good enough to produce a maximum power output of 139 PS and a maximum torque of 183 Nm. Except for the base E variant, in which the engine is mated to a 5-speed manual, the other three variants offer a 6-speed conventional torque converter. The engine, though high on refinement and packing in adequate punch, lacks a bit in the department of fuel efficiency. Contrary to the MUV segment in which the safety features take a backseat, the Innova, thanks to its premium positioning, comes with all the essential protection gears one expects in a vehicle tagged at this price. Apart from the regular front airbags and ABS with EBD, the Toyota Innova also comes equipped with EBD, brake assist, vehicle stability control, traction control, hill start assist, front and rear parking sensors, side, curtain and knee airbags, and ISOFIX mounts. At RM 125,324, the top-spec Innova, with all the bells and whistles, might look a pricey vehicle to some. However, there is hardly any mechanical or aesthetical fault one can find in the Innova. The MUV feels upgraded and upmarket in almost all the aspects – be it styling, performance, comfort, or equipment levels. The Innova makes you feel that MUVs can look stylish and be desirable. Also, the comfort level and space offered inside is clearly unmatchable. Undoubtedly, the Innova has been the king of the segment and given the finesse of the new generation model. What are the Safety Features Available in Toyota Innova?